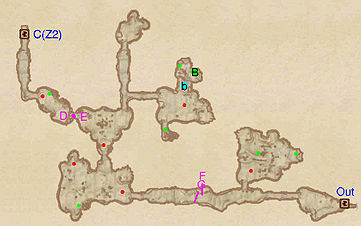 Undertow Cavern is a medium-sized cave north of Leyawiin containing bandits (quest-related). It contains two zones: Undertow Cavern and Undertow Cavern Hold-Your-Breath. Black Bow Bandits: Tag along with Mazoga the Orc to track down and kill Black Bow Bandits (non-journal). Vantus Prelius and his men can be found outside of the cave once you have completed the Fighters Guild quest Drunk and Disorderly. This cave contains 17 Cairn Bolete plants and 9 Wisp Stalk plants. 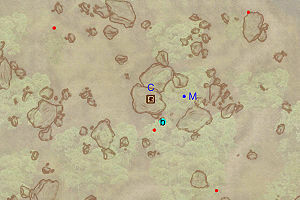 This location's map marker (M on map) is named Undertow Cavern (editor name UndertowCavernMapMarker). The entrance door is W of the marker, 50 feet away. This is a fairly straightforward zone with only two detours. Immediately after entering, head north into a room with an enemy and two minor loot chests. Follow the corridor to the next room, avoiding the falling log trap at F. In the next room you may face up to three enemies at the same time, so be ready. Loot the nearby chest and head north and then east. In this room you will find a Black Bow Bandit guarding a boss chest (B), two minor loot chests and a bedroll (b). Head back and press west, avoiding the swinging mace trap at D. In the final room is another enemy, a chest and the door (C) to Hold-Your-Breath. 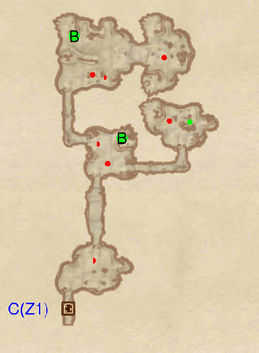 True to its name, this zone is mostly underwater. Water Breathing is recommended but not necessary: there is a chance to catch your breath in every room. 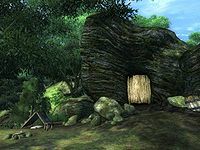 There are slaughterfish in each room, in particular up to two in the second room and up to three in the northernmost one. 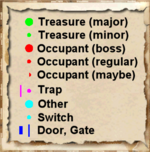 These two rooms each contain a boss chest (B), while a smaller room to the east only boasts a minor loot chest. This page was last modified on 25 March 2018, at 03:17.